Zetzellia mali is a predatory mite that attacks European red mite and apple rust mite. It is found throughout the United States and is in most orchards at some level. It can contribute to biological control of pest mites, although a drawback of this mite is that it also preys on eggs of the predatory phytoseiid mites Typhlodromus occidentalis and T. pyri. Z. mali may not be able to control high pest mite populations, but where populations have been lowered by other predatory mites it alone can keep European red mites at low levels for long periods of time, perhaps several years, if undisturbed by harmful pesticides. When the food supply is low, Z. mali is better able to survive than T. occidentalis or T. pyri. Z. mali is commonly found on tree fruits, particularly apples. 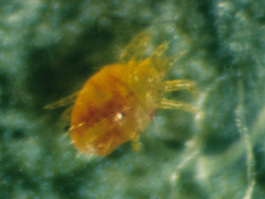 It preys on eggs and immature stages of European red mite and on active stages of apple rust mite. It will also feed on other predatory mites and other Z. mali. The egg is round, lemon yellow and smaller than that of a spider mite. The nymph is lemon yellow but turns reddish yellow after feeding on European red mites. The adult is lemon yellow to reddish and slow moving. It is almost oval but is more pointed at the rear and slightly smaller than a spider mite. Females overwinter in cracks or crevices on twigs or bark, or under empty scales of San Jose scale. They emerge in April and infest unfolding leaves of developing buds. The mite develops through several generations during the summer. Females begin to search for overwintering sites in September but may be found on leaves as late as November. Populations depend to some extent on the numbers of apple rust mites available as prey. Z. mali is easy to see and can be monitored by sampling leaves. However, no optimum predator-prey ratios have been established. Z. mali is sometimes found in large numbers in unsprayed orchards. It is resistant to organophosphate insecticides but, unlike T. occidentalis and T. pyri, is susceptible to endosulfan. Z. mali can be introduced into an orchard on shoots from inhabited trees, but the potential benefits should be weighed against the risk that it will prey to some extent on other predatory mites.